The Radioiodine Fume Hood meets the demands of iodination procedures. Constructed of 3/8" clear, rugged plexiglass, the fume hood provides a large internal work area with spacious arm ports to allow maximum uninhibited manipulation of material within the unit. A swing-away front door permits easy placement and retrieval of items. The air baffle assures even flow speed of air out of the box while negative air flow speed can be adjusted from 0 to a maximum of 50 CFM. The Fume Hood includes a disposable 12" x 12" x 1" metal frame filter that contains TEDA charcoal, trapping 90% of the radioiodine produced. 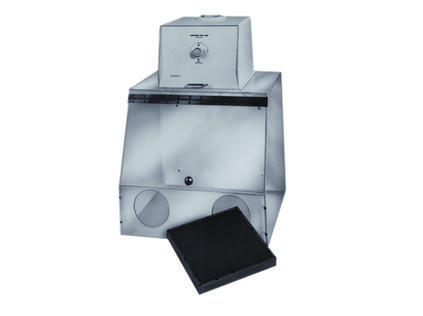 The Fume Hood can accommodate two filters if needed.